For the past year, Matt Weston has been frustrated by his inactive, backwater post in Cape Town. A “housekeeper” who aspires to be a full-fledged agent, the loyal company man has been waiting for an opportunity to prove himself. When the first and only occupant he’s had proves to be the most dangerous man he’s ever met, Weston readies for duty. Tobin Frost has eluded capture for almost a decade. One of the best ops men that the CIA’s known, the ex-intelligence officer has given up assets and sold military intel to anyone with cash since he turned. From trading secrets to North Korea to aiding splinter cells, the damage he’s done to the U.S. is immeasurable. And he’s now back on the reservation with a secret. As soon as Frost is brought in for debriefing, mercenaries come and tear apart Weston’s safe house. Barely escaping, the unlikely partners must discover if their attackers have been sent by terrorists or someone on the inside who will kill anyone standing in the way. 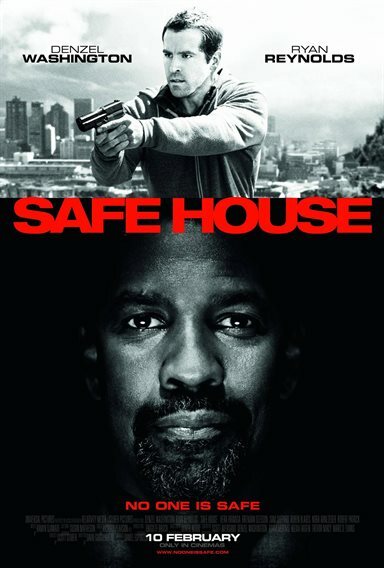 Download Safe House in Digital HD from the iTunes store. Safe House images are © Universal Pictures. All Rights Reserved. If you like your movies with constant action from beginning to end, then go and check out Safe House, a thrill a minute. As a matter of fact, Ryan Reynolds has successfully crossed the line between comedy and drama with a performance like he has never delivered. If all of a sudden you get an epiphany on where the film's going, not to worry, the predictability even has some enjoyable twists and turns. The story centers on CIA employee Matt Weston (Ryan Reynolds) who has been babysitting a boring job tending an interrogation facility safe house in South Africa. With little chance to become a full-fledged agent, he finds himself deadened. Just as he gets off the phone with his boss David Barlow (Brendan Gleeson) a tactical team bursts into his safe house with Tobin Frost (Denzel Washington) the most notorious rogue intelligence officer in the world. Feared by the FBI, CIA and even foreign spy agencies, Frost has information that will take hundreds of moles and corrupt agents down. When the tactical team gets killed, Weston makes a run for it with Frost in tow. Reynolds puts on a great show as the want-to-be spy who finds himself on a dark road to a different kind of dead-end. With the most wanted man in the world needing protection, South African killers looking for him and no one to trust but his boss, it's a crap shoot at best for him and Frost to survive. Hell bent on succeeding, Reynolds's character delivery provides a big entertaining surprise. Congratulations Ryan, I really didn't think you had it in you for a thriller. A normal reaction to think that since Denzel Washington's name has a connection with a movie, that he has the starring role, however in Safe House he's the catalyst and not the focus. Giving his usual good performance as the dangerous Frost, a support character, he does make the film work. Some may call this a ‘buddy' film, but in my book Reynolds the top dog here. Director Daniel Espinosa keeps the motor running with some great confrontations, amazing chase scenes, phenomenal stunts and relentless energy on the part of his actors. Keeping the film tight, even the nearly two-hour length seems like half that amount of time. The spark keeps igniting at ever twist and turn even though you may know where the film is taking you and about to reveal. The MPAA has rated Safe House R for strong violence throughout and some language. The beatings, shootings and close quarter fights are so realistic, I cringed at times. The movie was filmed in Cape Town South Africa, Paris and Washington D.C.